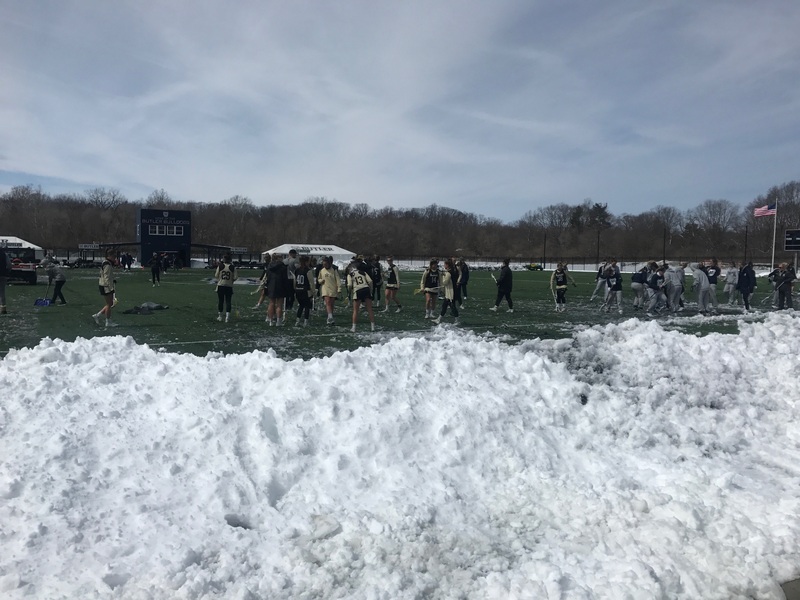 Vanderbilt and Butler players work together to clear the snow off Varsity Field on March 25. The game was delayed by over three hours due to a 10-inch snowfall in Indianapolis the day before. Photo by Jimmy Lafakis. The Butler University women’s lacrosse team fell 17-8 to Vanderbilt University on March 25. The match was slated to start at noon, but was delayed over three hours due to nearly 10 inches of snow on Varsity Field. Vanderbilt and Butler players along with staff and parents helped clear the AstroTurf surface. Butler trailed 10-2 at the intermission. The Bulldogs picked up the intensity in the second half, scoring six goals. Sophomore midfielder Christina Soderquist scored half of Butler’s goals. She now has 14 goals on the season. Four different Bulldogs found the back of the net. Freshman attacker Morgan Paige added two goals of her own. Redshirt junior midfielder Haley Hallenbeck added two goals and earned two draw controls. The Bulldogs will travel to Denver University for their next match. The Big East tilt will start at 3 p.m. on March 31.